The end of the restoration project of the Flying Scotsman locomotive is in sight, and the National Railway Museum will be offering a new show for school groups to celebrate. The York-based museum has revealed Need for Speed, a Science show for Key Stage 2 school groups that will be available from 29th February. What will the class learn? Need for Speed is an interactive show aimed at children aged between seven and 11 years old. The class will be led by a guide to learn about the Science of speed and find out about the famous Flying Scotsman locomotive through interactive demonstrations. The show will begin by taking a look at steam engines, before moving chronologically through time to explore the development of rail transport. Each section will look at faster engines, through diesel, electric and maglevs (a transport method that uses magnetic levitation to move vehicles without touching the ground). Pupils can get involved throughout the show by assisting with various experiments, and the show will also explore some possibilities for the future of railway travel as well. The show will last approximately 25 minutes and will be available to groups of up to 140 students per show. It provides an interactive take on the Science section of the National Curriculum and focuses on working scientifically, states of matter, electricity and rock materials. What else can you do at the NRM? Between February and June, a series of other exhibitions will be running at the museum to celebrate the Flying Scotsman restoration. A second exhibition, Stunts, Speed and Style, will run from 15th March until 8th May and showcases the history of luxury travel. For further school travel information call 01904-686230 or visit www.nrm.org.uk/Education. 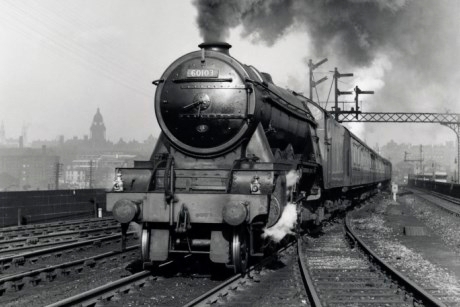 Pictured: Flying Scotsman A3 class steam locomotive leaving Leeds station, 1956. (Photo credit: NRM).